This cake is best made one, even two days ahead, mainly because the coconut flavor gets better as it sits. 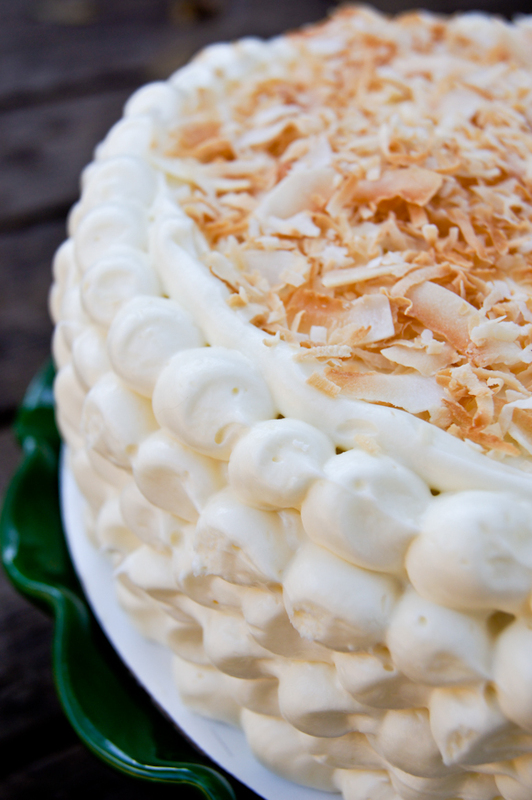 It has four components: the coconut cake, the coconut pastry cream filling, the syrup and the frosting. I have used two types of frosting with this cake: a cream cheese based one, spiked with some lime juice in order to give it a “tang” or the classic fluffy Meringue frosting. Both work, but I prefer the cream cheese based one and that is the one that I included here. If you want the Meringue frosting you can find it here. The trick to this cake is to use as much coconut flavor as you can in every single component by using ingredients made with coconut - For the cake and the cream filling, coconut milk. Coconut liqueur for the rum syrup and coconut cream for the frosting. It’s like eating one big cloud of coconut heaven. Let’s get started. Preheat oven to 350°F. Butter and flour two 9-inch-diameter cake pans with 2-inch-high sides. Whisk flour, baking powder, baking soda and ½ teaspoon salt in medium bowl to blend. Using your mixer, beat sugar, butter and sweetened cream of coconut in large bowl until fluffy. Beat in egg yolks and vanilla extract. On low speed, beat in dry ingredients and then buttermilk, each just until blended. In another large clean bowl, beat egg whites with pinch of salt until stiff but not dry. Fold beaten egg whites into batter. ½ teaspoon pure vanilla extract or coconut extract if you want more intense flavor. Combine the milk and lime peel in a medium non reactive saucepan and bring to a simmer over low heat. Whisk together the yolks, sugar and cornstarch in a large bowl. Slowly whisk the warm milk into the egg mixture then return the mixture to the pot over medium heat and bring to a slow boil, whisking constantly, until thickened. Remove and strain through a fine sieve into another bowl, stir in the rum and vanilla/coconut extract. Cover with plastic wrap pressed right against the pastry cream. This will prevent a thick skin from forming on the surface. Let it cool to room temperature. Refrigerate until cold, at least 2 hours. In a small saucepan, combine the water and sugar and bring to a boil over medium-high heat, stirring occasionally to dissolve the sugar. Remove the pan from the heat and stir in the rum. Set aside to bring to room temperate. Major tip: Make sure your cake is cold, this way it will easier to cut the cake layers as well as soak and frost. The best thing to do is bake it a day ahead and once it cools off, wrap and put in the refrigerator overnight. Place one cake layer on cake plate and cut in half. Using a brush, soak the cake with the rum syrup, and then spread some of the coconut pastry cream filling over the cake layer. Cover with the other cut half. Again soak to top of the layer with syrup and then add some pastry cream. Cut the second layer of cake in half and stack one of the cut half on top the already assembled cake, and again, soak in syrup and top with pastry cream, cover with the last half layer, soak with syrup. Put it back in the refrigerator for about 1 hour to have everything firm up once more. Remove from the refrigerator and frost the whole cake. In the picture above, I used a pastry tip to make balls on the side of the cake. 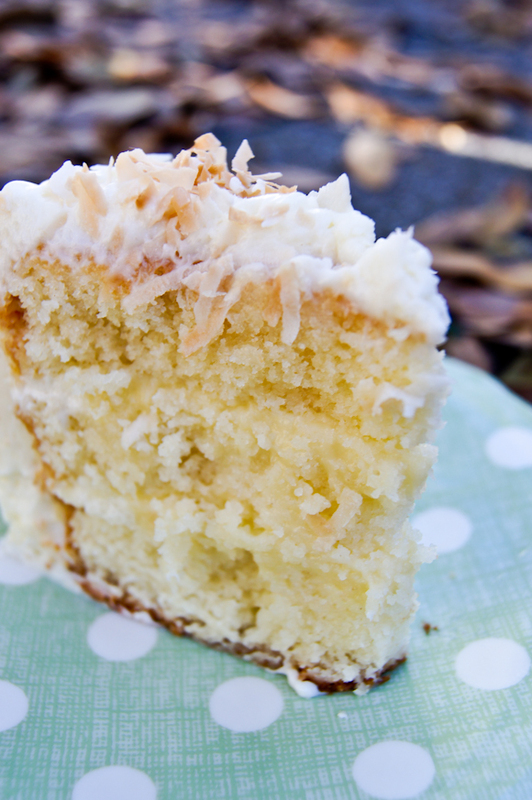 Then I smoothed the top with more frosting and sprinkled with toasted coconut. Back to the refrigerator it goes for final firm up. When you are ready to serve it, let stand at room temperature 2 hours before doing so. Now watch it do a magic trick when it disappear in front of your eyes. I made it for Saturday, by Sunday it was gone.